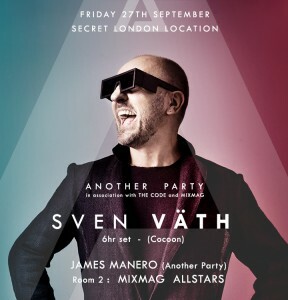 In association with The Code and Mixmag, Another Party present – Techno’s equivalent of God: Sven Väth. Honoured as the first promoters in over a decade to host Sven outside of his label, festival or a club, the Techno legend will be conducting a behemoth 6 hour London special, possibly shooting lightning bolts from his fingertips too. A key figure in electronic music history, Sven Väth has been hugely influential in the progression of House and Techno. With almost 3 decades behind the decks, his huge following has far surpassed critical mass. This epic event coincides with his relocation to our fair capital. Joining Sven will be Another Party’s co-founder, James Manero, fresh from his set at the Cadenza Music 10 Year Anniversary. 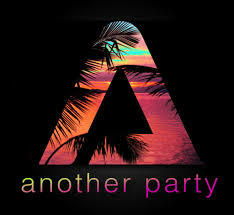 Over the years Another Party have carved an enviable niche for themselves in the industry. Known for their high calibre of home-bred and international artists – they combine high production values, world-class sound systems with an OCD attention to detail. Since it’s conception in 2008, the brand have hosted some real dance music royalty. This includes Tiefschwarz, Shonky, Troy Pierce, Dan Ghenacia and Shaun Reeves, to name but a few. Having garnered the best elements from clubs and underground raves, then added their own unique flavour, they continue to break boundaries – setting new and unbeatable standards. The location of this event is absolutely, ridiculously top secret information! However, we do know that you can expect some dazzling, state of the art lighting, 3D video mapping and a sound system so powerful it’ll blow a hole though Central London. This is the perfect spot to enjoy raw underground music at its best. After the huge success of their last party, featuring the amazing Soul Clap, Another Party return with one of their biggest and most exciting shows to date. Be there.